I first wrote about this strategy years ago. The ZOMMA Ultra-Low Volatility index has done well on a walk-forward basis. There are some great quantitative reasons why. Here are the latest updated results. It's important that investors understand that an index doesn't need to be a collection of 500 large companies. An index can consist of ETPs chosen for their risk/reward, correlation, diversification, or dividend attributes. We call this a strategy index. 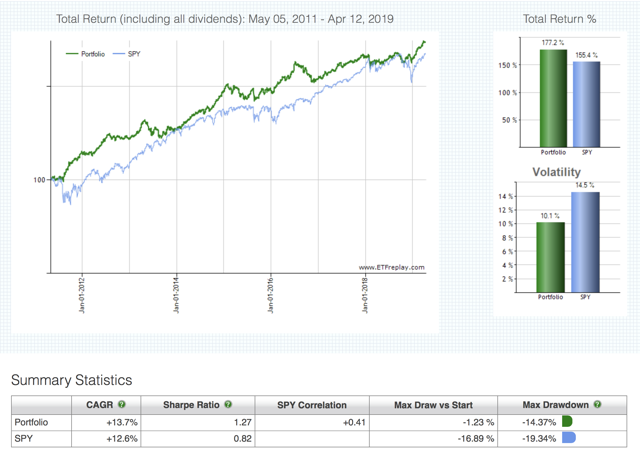 The evidence shows that quantitative systematic strategy indices can dramatically outperform traditional market-cap weighted passive indices. Elegant portfolio-level approaches to harvesting robust quantitative effects have been doing quite well, as my index firm has convincingly proven for years. Again and again, we have shown the strategies which focus on asset class level correlations, rather than stock picking, have far superior performance. Here is the average investor's basic decision: in an uncertain economy, should the investor focus on earnings momentum, or should the investor focus on robust quantitative factors? I would argue that the correct answer, not only theoretically, but also empirically, is that investors should focus on robust quantitative factors, such as correlation. Second, most investors should focus on harvesting advantageous quantitative effects within a highly diversified, multi-asset class framework. ZOMMA has created such a framework, our Ultra-Low Volatility index. Our Ultra-Low Volatility indices perform well because of the advantages of low-volatility investing. The low-volatility anomaly has been exhaustively, empirically documented by Dr. Robert Haugen and others. Simply put, low-volatility stocks tend to outperform high-volatility stocks - totally contrary to the popular notion that higher risk denotes higher potential return. The simple construction of the index makes it much more likely to evidence robust phenomenon (ultra-low volatility), rather than form-fitting. And these results have been achieved with a low correlation to the S&P 500. The logic behind the strategy is that, due to the nature of compounding gains and losses, a strategy which has extremely low volatility has the possibility to beating the market across an entire bull/bear cycle. For example, a 50% drawdown necessitate a 100% recovery in a portfolio to break even. We can see the non-linear nature of risk vs. return. "The math of percentages shows that as losses get larger, the return necessary to recover to break-even increases at a much faster rate. A loss of 10 percent necessitates an 11 percent gain to recover. Increase that loss to 25 percent and it takes a 33 percent gain to get back to break-even. A 50 percent loss requires a 100 percent gain to recover and an 80 percent loss necessitates 500 percent in gains to get back to where the investment value started." Therefore, the goal of the index is to not give up much equity upside by combining the S&P 500 Low Volatility ETF with a 3x leveraged exposure to long duration government bonds, which acts as an imperfect statistical hedge. When the stock market drops, long duration government bonds tend to rise. The addition of long duration government bond exposure to an already low-volatility stock index, further decreases volatility in a portfolio, and also decreases the correlation of the portfolio to the larger market. Strategically, the leverage inherent in TMF, we can allocate more capital to SPLV. In addition, it is not necessary to have margin exposure. So instead of the normal stock/bond mix, we are utilizing the S&P 500 Low Volatility ETF, then combining that with leveraged long duration government bond exposure, in an effort to further reduce drawdowns and volatility. Of course, a prolonged bear market in long duration government bonds would probably hurt this strategy index, but the total bond exposure at risk is only 20% in any given year, because the leveraged nature of TMF allows us to dedicate less capital to it. The index is not achieving long-term outperformance by rising more than the broader market during strong up years. It outperforms across a cycle by adhering to the general pattern of underperforming during strong up years and outperforming during strong down years. This leads to the happy result, which we have observed, of strong returns combined with low volatility. Standard & Poor's reports that over a "10-year investment horizon, 82.14% of large-cap managers, 87.61% of mid-cap managers, and 88.42% of small-cap managers failed to outperform on a relative basis." Clearly, the answer is not more reckless emotional decision-making. The answer is the creation of evidence-based indices which exploit market inefficiencies and combine diversification with ingenuity and discipline. We believe strategy index technology will beat most human investors over time. Rather than guessing on market direction, we are finding robust evidence-based advantages to incorporate into index-based solutions. Thus, evidence-based multi-asset class indices can beat the stock market. And the mechanism is clearly defined evidence-based insights into the long-term drivers of robust, sustainable outperformance. Buy the PowerShares S&P 500 Low Volatility Portfolio ETF (NYSEARCA:SPLV) with 80% of the dollar value of the portfolio. Buy the Direxion Daily 30-Year Treasury Bull 3x Shares ETF (NYSEARCA:TMF) with 20% of the dollar value of the portfolio. Rebalance monthly to maintain the 80%/20% dollar value split between the positions. I caution readers that this index should serve as a building block as part of a larger strategy. It should not stand alone. Here's why: even though the index is far safer than plain vanilla equity exposure, there are substantial periods of time in the distant past in which the index dramatically underperformed. Therefore, it is most appropriate to understand the low volatility approach in the context as a building block for a more complex strategy, such as some of our multi-asset class indices.